Most of us love nothing more than chilling out on the lake with our inflatable kayaks. Whether you’re intending to fish or just enjoying the view, there are many factors to consider before making that purchase and finding the best inflatable kayak. Especially if you’re not a seasoned buyer. Knowing what type of kayak you need for the specific activity you’re planning, along with understanding how long you’ll use it for, is essential. If you’re quite the adventure buff and like to travel around to search out the most thrilling spots, a huge kayak that is bulky and difficult to transport might not be your thing. Instead, you might want to consider an inflatable kayak they are much like an inflatable stand up SUP that is sturdy, stable, strong and much easier to store and transport. You shouldn’t think a blow up inflatable is a lot weaker though. With technological advances and improved design these days, they can be extremely strong and durable. In this article, I’ve rounded up 10 of the best inflatable kayaks you can buy for various purposes and price points. Are Inflatable Kayaks Good For Beginners? Are Inflatable Kayaks Good For Fishing? If you have ever dreamed of an ergonomic product which will allow for smooth paddling, and relieve any discomfort and back pain you might experience, the Intex Explorer K2 Tandem Kayak has got you covered. Featuring tall inflatable seats with backrests, this is designed for your convenience and comfort, even after hours of use. Its striking yellow colors and design acts as a safety measure to make you, and your kayaking partner easier to spot in the water. You may also know that trips are much more enjoyable when you bring a friend or a loved one with you. That’s why this easily accommodates for 2 people, while still allowing for ample leg room or equipment storage. For an inflatable, this Intex Explorer is actually surprisingly spacious. It’s entirely common for even the best inflatable kayaks not have much space for anything other than basic seating but with this Intex Explorer K2, you’ll have ample, comfortable space for two people while still having enough room for some food or equipment. If you’re an avid fisherman, you’ll be happy to know you’ll probably have enough space to lug along some fishing gear. There are even two individual air chambers that are separated, making it very effective in handling any potential punctures. Designed to be on the floor and the main hull of the inflatable kayak, you can count on it to stay buoyant in the unlikely event of a puncture because of the two separate air chambers. You’d also be glad to know that its bottom is reinforced, giving added protection to the floor chamber. The Intex Explorer K2 will give you both the opportunity to explore smaller bodies of water such as lakes, and mild rivers since the inflatable design allows for increased maneuverability without running the risk of dangerous punctures. That’s due to its incredibly resistant heavy duty vinyl material. However, if an emergency does occur, it is equipped with a repair kit which will give you peace of mind. Read the full Intex Explorer K2 review here. Resembling a heavy duty commando kayak, the Sevylor Coleman Colorado can easily be considered one of the best choices for fishing. Constructed out of 18-gauge PVC, this design is ideal for mild waters, and lakes. This is known as a strong contender when it comes to exploring your favorite fishing holes as its thick tarpaulin bottom, and sturdy, thick nylon cover will stand to the test. It’s certainly superior in the market for its durability, and enhanced toughness. Worrying about punctures is a thing of the past with the Coleman is equipped with multiple air chambers which allow it to stay afloat in the unlikely event of a puncture. Additionally, the Airtight System is guaranteed not to leak, leaving it in a pristine, and safe condition. It’s als conveniently designed to inflate and deflate quickly so you won’t take long to get all set up. You can also count on it for its multiple air chambers. If it ever suffers a puncture, you can be reassured that its design means air will be distributed so the other chamber remains inflated, and afloat. Because the main use should be fishing, this has Berkley quick set rod holders, an adjustable extra which allows for enhanced hands-free fishing. There are also paddle holders that secure your paddles out of the way for when you do catch something. Moreover, the mesh storage pockets keep gear, and snacks within arm’s reach and protects them from damage or corrosion. Perfect for both paddling as well as fishing, this Coleman is versatile, safe, and spacious – a good choice for your money. Read the full Coleman Colorado Kayak Review here. Constructed out of sturdy welded materials, this durable, and stable kayak puts emphasis on your safety. Either when on a lake or a slow-moving river. Featuring heavy duty puncture-resistant vinyl, the Challenger is easy to use, and maintain due to its Boston valves which are perfect for quick, and straightforward inflation and deflation. In addition, there is a repair kit in case of any accidents so you can rest assured that you will feel safe even in this one-person inflatable. This blow up kayak is known to be one of the cheaper ones in the market yet it is extremely effective, and well designed. Similar to other products on the market, the kayak makes use of a cockpit which allows for both comfort, and security. Equipped with an inflatable high seat made for lumbar support, this design maximizes space. It even comes with a cargo net for storing extra gear, and grabbing the line on both ends. Despite being lightweight, it is certainly not feeble. In fact, it has a capacity of 220 lbs. In the interest of safety, one thing that stands out about this Intex Challenger k1 is its bright, luminous designs, and decals meant to make you easily visible on the water. If this is your first kayaking experience, the Challenger is a great option for you, especially considering that the inflatable feature L-beam floors add stability, and a higher degree of resistance. Taking it along on your trips will be fuss-free since it’s designed to collapse easily, and even fit in the trunk of your car. With such portability, you can easily get even more adventurous the next time you’re looking for new thrilling kayaking locations. This kayak bundle comes with everything you need including an 84” aluminum oar, a handy puncture repair kit, and an high output hand pump. Read the full Intex Challenger k1 review here. Quality has always been a top priority for the Coleman brand so it comes as little surprise that the Tahiti is constructed out of sturdy 21-gauge PVC material. Ideal for lake use, this 2 person inflatable kayak is a budget friendly kayak which still features many of the characteristics of higher-end products. More specifically, there is an ergonomic aspect to the Tahiti, as it is equipped with 2 inflatable seats for added comfort, and relief from back aches. In addition, featuring ample legroom, and storage capabilities, the product can withstand a weight of up to 360 lbs. Its self-bailing feature means it is suitable for most kinds of water but you should be cautious not to take it into anything too extreme or tedious. In terms of its other features, the yellow colored kayak has multiple air chambers which allow it to still float despite any potential puncture holes, whereas the Airtight System is guaranteed to not let any leaks occur. It’s also designed to give you a little more space beyond the seats so you, and your kayaking partner can take along some extra gear, and supplies. One of the best merits is its ease of use: featuring a mini double lock, and double lock valves which use locking points for easy inflation/deflation; it’s simple to either prepare or end your journey; and is stress-free. It’s also designed to be extremely portable, and easy to fit in the trunk of your car. Known for its affordable price point, this is a great starting point for beginners, kids, or for a short travel trip. Read the full review here for the Tahiti Classic. This two-person inflatable kayak, at only 26 pounds, is designed to be incredibly lightweight. Even though it is the smallest in the Sea Eagle Sport series, it has an impressive carrying capacity of around 500 pounds, and it is not to be underestimated. Not only does the beautifully-named Sea Eagle SE370 allow for a generous roomy interior, and ease of movement, it is also known for its great durability and stability. More specifically, it’s constructed of puncture-resistant, extra-thick K-80 polykrylar hull material, I-beam construction, and high-frequency welded seams which makes it a highly-acclaimed product for Class III whitewater. The tubes in this inflatable kayak are also designed to be bigger which helps to make the floor more rigid, and solid. This gives rise to faster speed, and better tracking. Accessories: AB30 paddles, (2) inflatable movable & removable DKS seats, foot pump and carry bag with convenient shoulder strap. Everything about the Sea Eagle is designed to be convenient, and easy – inflates and deflates within minutes, easy to carry, paddle, and to sit in for hours. It’s perfect for camping trips, fishing, leisure paddling, and more having been designed to be very versatile across different scenarios. The deluxe air valves deserve special mention as most blow up kayaks in the similar price bracket suffer from poorly designed air valves. The Sea Eagle’s 5 deluxe one-way air valves are strong, reliable, and don’t have a tendency to crack or leak. The brand is so confident in its product that it even offers a fuss-free 3-year warranty against any and all manufacturer’s defects. This long-term warranty is pretty much unheard of, making this product a great value for money. The Sevylor Quikpak K1 gives you the ability to enjoy your favorite waters without much fuss as it only takes 5 minutes to set up this. Known to be unrivaled in its portability, and ease of use, this Quikpak’s seat is designed to double up as a backpack. Simply deflate, fold it up into its own backpack, and away you go! Weighing a mere 16.5 lbs, this inflatable is super light, and convenient to carry around or take along on your trips. Durability has also been a high priority, and that’s why it features a 21-gauge PVC construction, making it ideal for lake explorations. It is well equipped with a strong tarpaulin bottom which provides durable protection against scrapes and punctures. However, in case the damage happens to be too extensive, the multiple air chambers will keep you afloat until you reach land. This one-person canoe is ergonomically designed, featuring a high backrest which lets you enjoy the quiet waters for prolonged periods of time. There is also a multi-position footrest that allows you to find the most comfortable position for you. Easily store your equipment and supplies in the cargo net provided, and enjoy the handy cup holder that is within your reach. No trip is truly complete without your family or pet that’s why the Aquaglide Chinook XP Tandem XL has been designed for family use, providing ample room for two adults, a child, equipment or even your best four-legged best friend. Constructed out of high-quality materials including 600D polyester and Duratex, this product is meant to provide you with peace of mind, and security while your family is on board. Featuring XP floor technology for excellent paddling performance, this uses an inflatable chamber in order to create a sturdy and durable PVC beam floor. Comfort is also a top priority, and that’s why the kayak has two ergonomically shaped backrests, closed cell seat cushions, and large mesh storage pockets for keeping snacks or extra equipment. Setup is also incredibly easy, despite the large size of this product. More specifically, there is a fin system which includes a unique quick-release for easy setup. The integrated fishing rod holders, and strong molded handles are extra details that add even more convenience to your experience. In terms of storage, there is generous space, and when deflated, it can fit into the complimentary bag provided by the company. Overall, this boat is ideally suited for family escapades, and its durability and sturdiness means it’ll be a great companion for exploring. If you are planning on going kayaking with your dog, then its best to read up on some training tips before you go to ensure you and your pooch have the best time possible. 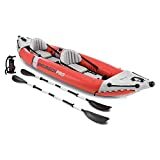 Designed as a compact kayak ideal for lower budgets, the Advanced Elements Firefly Inflatable-Kayak carries some unique features which improve its overall durability, and performance. 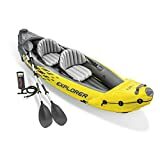 Whether you’re in search of an inflatable kayak for a leisurely tour of lakes or needing something more sturdy for paddling around rivers, this kayak is able to meet your needs. Featuring ergonomic rubber-grip handles, a bungee deck lacing, along with a mesh accessory pocket, and tracking SKEG, this product is designed for your convenience, and enjoyment. The bow and stern rigid forms are built into the cover, which gives the kayak increased performance when in water. It’s also easy to carry and get out of the water with its strong rubber handles. Easy to set up, this lightweight Firefly kayak offers Twist Lock valves, and a high flow Spring valve which makes for quick inflation and deflation. Weighing in at a mere 16 pounds, it’s easily portable yet sturdy enough to carry a maximum of 250 pounds. Store it easily in the trunk of your car or even tuck it away in your wardrobe at home when not in use. As previously mentioned, the one-person inflatable is a recreational kayak that features a bow and stern which have rigid forms, helping you seamlessly cut through any waves. This characteristic can also help you stay on course while the unique outer cover provides added sturdiness, even over time. This means that whether you’re simply spending time on the water, floating, or paddling crystal clear lakes, the Advanced Elements shows improved performance at a highly-affordable price point. With its one-year warranty, this company is also well known for its good customer service. This olive kayak is constructed using 21-gauge PVC construction which makes it perfect for lake use. Known for its reliability and sturdiness, this kayak is able to withstand rugged waters, and strong currents. Featuring the multiple air chambers, and Airtight System Sevylor customers are used to, this kayak is designed to stay inflated even in the unlikely event of a puncture. It’s even great for hunting since its colors can help you blend into your surroundings, and creep in quietly! The Tahiti is known for its versatility – whether it’s slow, quiet rivers or ponds and lakes, this kayak is equally equipped to take you through safely. Similar to other products the brand features, the Tahiti 3 Person has an ergonomic design which gives its passengers plenty of room to rest their feet during long explorations. Ideal for family escapades around the lake, the NMMA certified product can hold up to 360 lbs. It is easy to inflate and deflate using the double lock system, making it an ideal and versatile choice for weekend getaways. It weighs only 19 lbs when deflated, meaning you can carry it easily and transport it conveniently. Including a limited 90-day warranty, the brand values its customers, and customers seem to agree that the company is ready to lend a hand in case of manufacturer defects. Holding capacity of up to 360 lb. Read the full review for the Sevylor Tahiti here. If you’re looking for a spacious canoe which is designed for lakes, and moderate white waters, the Airhead Montana may just be the kayak for you. This 12-foot model is incredibly portable because, despite its appearance, it is undoubtedly lightweight. Ergonomics was also a top priority in its design, as the kayak features durable neoprene elbow guards along with movable, and comfortable removable inflatable seats. This provides increased lumbar support and comfort, which is particularly important considering its moderate intensity use. Despite its light weight, this kayak is actually surprisingly strong, and stable. The compact 2-man kayak values safety, and that’s why its construction relies on semi-rigid heavy gauge PVC materials, along with a tubular L-beam floor which gives you superior tracking, speed, and buoyancy. Strong D-rings are constructed onto the bow and sterns so you can secure your equipment, and gear easily. You can even store your supplies conveniently in the handy stretch net. It’s hard not to acknowledge how easy it is to inflate and deflate this blow up kayak, as there are 2 Boston valves which can do this for you faster than you can even find a parking spot. Additionally, the Airhead Montana is equipped with 3 air chambers which are fully enclosed by rugged 840-denier nylon with UV and water-resistant coatings. Check out the full review for the Airhead Montana here. If you’re planning your next summer escapade, an blow up kayak is a great item to carry around, and that’s due to its lightness. In fact, it’s so light that it can be transported in a medium-sized backpack. This relates to the first point we’ve made. Because it’s easy to carry around, you can take it with you on a variety of different occasions. For example, you can paddle in remote locations that a rigid kayak would not have access to. The best part is that you won’t even need a roof rack or trailer. Easily stored in a closet or shelf, inflatable kayaks can be effortlessly deflated to the size of a duffel bag. Convenience at its best! An inflatable kayak can adapt to your needs. In other words, whether you’re planning on fishing, water rafting, or touring, this product can meet your requirements. I know you may be thinking it’s hard to inflate one of these things –but it’s actually not. Commonly equipped with an electric pump, you can have it inflated or deflated within a matter of minutes. It probably takes less time than when you try to find a parking spot. It’s not uncommon for owners to worry about potential scratches and dings, especially during transportation. Although there is a risk of punctures, it only requires you to stay away from any sharp object; which you should anyway, for your own safety. There’s no need to clean it either, just fold it, and be on your way. Because you are able to conveniently store them in your car, backpack, or locker, worrying about your kayak being stolen is a thing of the past. You can simply keep it with you at all times. Considered the best and most ergonomic model for padding calmer waters, these kayaks allow you to sit on top, as the name suggests. If this is hard to imagine, picture yourself on a full-size seat with an appropriate backrest in which you can change positions as you deem fit. Gone are the days when your feet cramp or your back hurts due to uncomfortable designs. Although you will still have a good level of comfort, you won’t be able to feel as relaxed as in a sit-on-top kayak. This is a traditional type where the lower body is fitted inside the boat. Although there is a small compromise on comfort, the design allows for smoother paddling in choppy waters or whitewater paddling. The canoe type is characterized by a flatter bottom, and higher walls. The good part is that it allows for enough space to move around, and carry supplies or equipment. That’s the reason why the canoe type is ideal for fishing since 2 people can comfortably sit in with a steady supply of beer, and bait. The smell won’t improve though! Considered an innovative kayak which has impressed many people around the world, these kayaks are rigid and sturdy, allowing you to even stand up while paddling. Although most models are rigid, you can find some inflatable models around as well. Commonly found at general stores, self-bailing kayaks are the cheaper version, and that speaks miles for the quality as well. By that, we mean that these models are made from lower quality materials, and although they’re a good option for shallow waters, they should not be taken into the sea or furious rivers. It’s safe to say that price is one of the first things people consider when buying a new product. That’s because you don’t want to step too high over your financial boundaries. One of the main benefits of an inflatable kayak is that compared to a rigid one, inflatables have considerably lower prices unless you go for the higher-end models. After you understand your budget and its limits, you now need to consider what you’re going to be using a kayak for. On the one hand, a self-bailing blow up kayak is an ideal choice for whitewater rafting or other high-speed conditions. On the other hand, calmer waters usually call for a canoe type inflatable, one that can easily be used for fishing. That’s why it’s vital to figure out what its usage is before you purchase a kayak, regardless of it being an expensive or cheap model. As previously mentioned, the kayak you choose should only suit your own individual needs. For example, if you love calm waters and want to bring yourself, and your friend a couple of cold brews, you will need good storage space. For example, sit-inside kayaks allow for limited additional storage –commonly around both hulls. The best choice, however, is an open type canoe kayak, especially if you don’t have a tandem paddler or someone to help you. Ergonomics is important for any activity. Consider your own needs, your body type, weight, height, and that’s because, for example, you may need some extra leg room. Alternatively, you may be prone to backaches, and there are models which offer a tall back seat for added support. This factor will make a big difference in your kayak fishing experience. Although there are a few more aspects to consider when choosing, these four factors are considered the most important. You will want a product which fits your budget, is perfectly suited for your needs, and has sufficient storage for all your kayaking gear. You need to make sure you bet the best kayak paddle for your adventures, there is nothing worst that getting out into the middle of the lake and the paddle breaking in two! Or Even worse dropping it into the water and it sinks to the bottom of the lake! The reality is that one of the worst things a beginner paddler can do is have their first kayaking experience in an unstable kayak. which could make them fall into the water, bruising both their ego, and their confidence. To answer the question of whether they are good for beginners, the answer is yes. However, it all goes back to the type of kayak you choose for your particular journey. Inflatables tend to be wide, and their pontoon-like sides offer adequate stability, making it almost unlikely to tip over. In addition to this, many rental and adventure companies use inflatable canoes for family escapades, fishing, and other expeditions. If they weren’t good for beginners, these companies would deem them as a liability, which they haven’t. Which inflatable kayak model will depend on your needs, however, it’s good to be safe and go for a middle-range model. Which allows for increased maneuverability, and ease of paddling. Although some cheaper models will also work in terms of durability, it’s a much better choice to invest in a versatile, and comfortable product. As mentioned before, certain inflatable canoes make for excellent fishing boats. In addition to the comfort aspect that they offer, you can even have the option of mounting a small motor. Moreover, because inflatables are easy to store and transport, they can easily be taken on road trips, camping trips, or even overseas. The best part is that you won’t need to pay a fortune to carry them on an airplane. The second reason for their brilliance is that you can explore fishing areas which wouldn’t be accessible by a larger boat. And that is one of the main reasons why the canoe fishing market is significantly growing. Many fishing enthusiasts realize the advantage of having an inflatable, as carrying out this hobby in a remote area increases your chances of catching more fish while also discovering the local flora. If you’re worried about using a fishing rod or hook, there is little reason for concern. An inflatable kayak is not like a balloon or an inflatable swimming pool. It can actually handle a fair amount of abuse. That doesn’t give you an excuse to test the theory though! What you should be considering is ergonomics. Because you will be spending a number of hours sitting, relaxing, and fishing, you don’t want to experience aches, pains, or cramps. Moreover, depending on your height, weight, and body size, it’s essential to consider how much leg room you will need. For example, some inflatables offer ample back support, in addition to a swivel seat which allows for added flexibility. If the model of your choice does not look comfortable, invest a tiny bit more for an incredibly important feature such as this one. I wrote this article to serve a round-up of some of the best inflatable kayaks available on the market to help you find your perfect kayak. Not only are inflatable kayaks ideal for camping, vacationing, or exploring remote areas, but they also provide convenience. This aspect relates to the fact that they are seamlessly easy to fit into a duffel bag or the trunk of your car, not requiring any additional storage (i.e. roof racks). Ultimately the top pick will be the one which fits your own individual requirements, and so take the time to consider what features you’d like from an inflatable kayak.